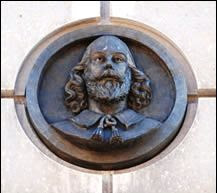 Almost unnoticeable embedded in the second story façade of The Caroline apartment building is a wonderful bronze relief bust of William Shakespeare. The Caroline was built in 2001, designed by Richard Cook & Associates and Costas Kondylis & Partners. A sleek blend of red brick and masonry with huge rooftop pergolas, slightly reminiscent of the Arts and Crafts school, it is perhaps the least expected place to find Shakespeare. 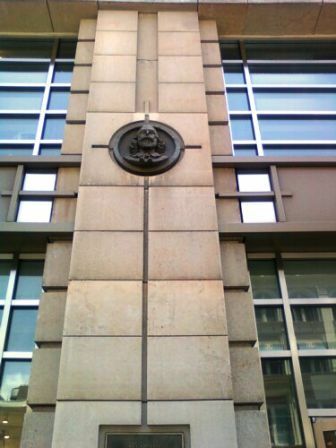 The architects had a hard act to follow in building at 60 West 23rd Street. On this site, in 1869, the great Shakespearean actor Edwin Booth opened his grand theatre. Designed by Renwick & Sands it was a colossal Second Empire pile. Constructed of granite and extending 150 feet from 6th Avenue, it cost a staggering $1.5 million. A masterwork of up-to-date technology, the building was cooled and heated with forced air. Electric sparks ignited the gas jets so the chandeliers and stage lights could be remotely turned on and off. Scenery was raised and lowered by an ingenious hydraulic system and it had a fire sprinkler system nearly a century ahead of its time. The floor of the grand vestibule was Italian marble and above the patrons’ heads colorful frescoes covered the ceiling. Here a large statue of Booth’s father, the renowned actor Junius Brutus Booth stood. More statues adorned the marble pillars in the auditorium, and a statue of Shakespeare stood above the proscenium. 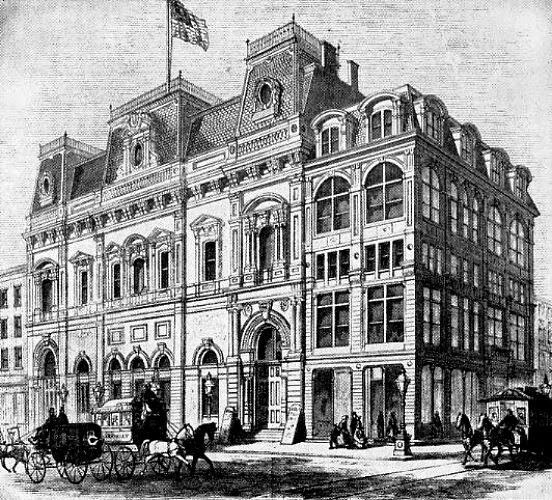 Although The New York Times called Booth’s Theatre, upon opening, "the pride of the City, the resort of the educated, a school of art, a refined recreation and a benign contrast to the perverted amusements which have too long degraded the public taste,” Booth’s management was poor. His extravagant productions with costly scenery and costuming bankrupted him. After what The Times called “five brilliant but disastrous seasons” he lost his beloved theatre. Nevertheless, the grand theatre was put up for sale in December of that year. It was purchased for a mere $550,000 by James W. McCreery and converted to McCreery’s Dry Goods, a retail store like the other emporiums lining 23rd Street’s Ladies’ Mile. It opened in 1895. In tribute to Booth’s grand theatre, McCreery commissioned a bronze relief bust of Shakespeare which was embedded into the façade. The magnificent building lasted until 1975 as loft space. 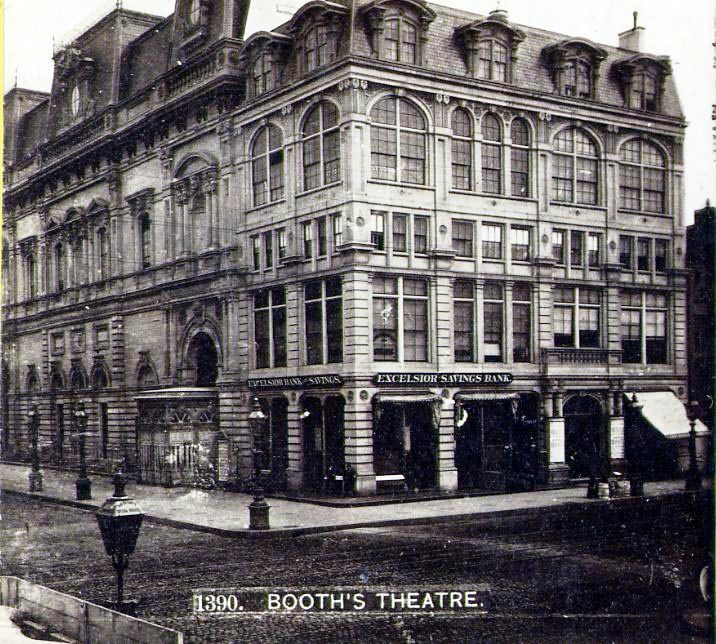 But then, in callous disregard for its historic and architectural importance, the Booth Theatre was demolished for a parking lot. Although the theatre was lost, tour guide Gerard Wolfe, a former New York University professor, single-handedly launched a movement to save the bust of Shakespeare. The University joined the cause and the bust was salvaged and displayed at the school. When The Caroline was erected, Shakespeare went home again. He stares down at the passing crowds on 6th Avenue just as he did a century ago. The Jane Street "Seamen's Friend Society"